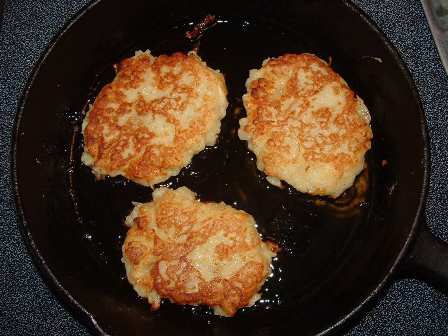 In Ulster County, Ireland they have a catchy little rhyme about Boxty: Boxty on the griddle, Boxty in the pan, If you can’t make Boxty, You’ll never get a man. Peel the potato and cut in half. Place one half of the potato in a bowl of cold water and reserve in the refrigerator.Cut remaining half of the potato into quarters and boil in salted water until soft. Drain the boiled potatoes and place in a bowl with the 2 tablespoons of butter and ¼ cup of milk. Mash until smooth, taste for salt. Grate the remaining potato, squeeze out excess water, and add the grated potato to the mashed potato. Add the flour, beaten egg, and ½ teaspoon of salt and mix well. Add milk to make a slightly thick batter. The batter should have the texture of very firm mashed potatoes. Heat your largest skillet over a medium high heat until very hot. Add a few tablespoons of oil to the skillet to barely coat the pan. Drop the batter by tablespoon into the skillet and then flatten until about 2 inches across. Repeat until you have three or four dollops in the pan. Fry until golden brown on the bottom, 2-3 minutes. Turn over and cook for another 3 minutes. Repeat with remaining batter until all the batter has been used, adding more oil as needed. Note: I add whole kernel corn, grated cheese, and minced onion to mine. Sometimes I will use yogurt or sour cream instead of buttermilk as I rarely have butter milk on hand. Make extra and freeze the pancakes for future use. To reheat, place frozen boxty on cookie sheet and bake at 400 to 425 for about 20 minutes—like you would do for frozen tater tots or french fries! Great recipe. Ulster is not a county, by the way, it’s a province. Thanks to Sorted Food, I will be making these goodies today!